SERVPRO of Largo is always on call for your water damage emergency. Flooding in a condo poses a great threat because it costs a significant amount to clean up the immediate damages, and deal with the issues that crop up after some time. In such a unit, it is easy for water to sit too long if the owner is away from home. The water also spreads easily from upper levels to lower ones if the incident starts in upper floors. Taking the right steps after discovering the problem should help restore the property to its preloss state. Dealing with any standing water is a crucial step during flood water removal in a Largo condo. Using sophisticated equipment such as water extractors and pumps is the most straightforward way to achieve this. However, because the water is also trapped in wall cavities and other concealed areas, other processes such as drilling weep holes and making flood cuts may be necessary. Our SERVPRO technicians use both portable and truck-mounted water extractors to ease access to any section of the property. Our WRT, Water Restoration Technicians also use their skills to perform the other steps expediting water removal. 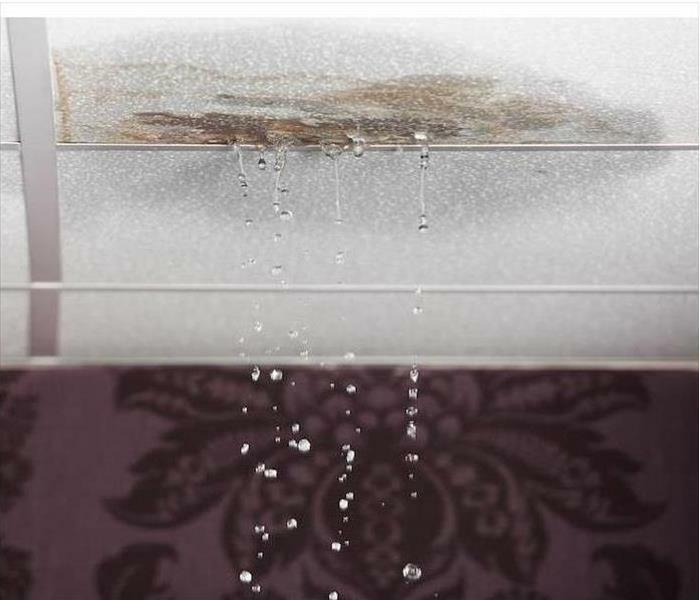 When water originates from a higher level, it can cause widespread damages to the contents in the lower levels. Protecting such items from severe damages is vital. Moving such items, or covering them can help protect them from dripping water and the debris produced during the other restoration steps. Our SERVPRO technicians use plastic sheets to protect contents in open spaces such as garages. Protection also allows us to work fast. Water permeates different building materials including drywall and insulation damaging their structural integrity. It also damages certain finishes such as paint causing it to bubble or chip away. In many cases, drying such materials cannot restore them to their preloss state. Our SERVPRO technicians carry out controlled teardown to remove all water-damaged materials. We also clean up all the debris eliminating the problems caused by the incident "Like it never even happened." When there is a flooding incident in your condo, call SERVPRO of Largo to help with removal. You can reach us at (727) 586-0060 any time of the day. We're Faster To Any Size Disaster. Read more about Largo here. 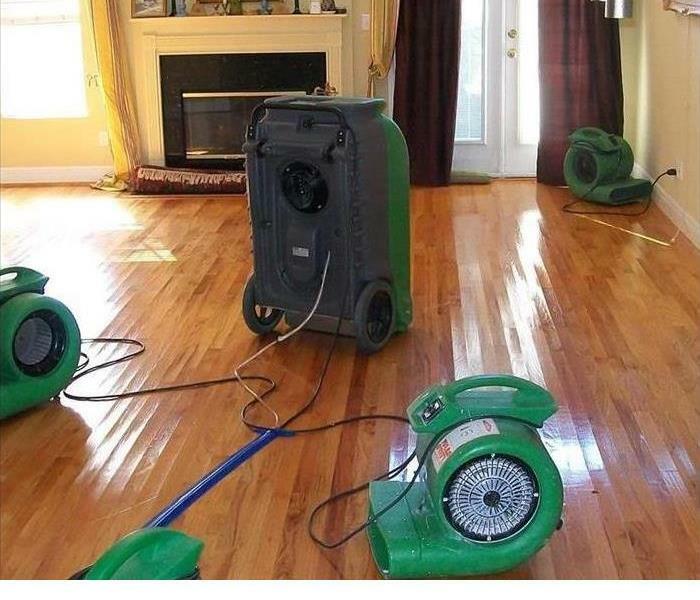 Our equipment restored the hardwoods in this home after water absorption. The"cupping" effect is visible in this photo. It can be tough to prepare for the elements to come straight into your home and interrupt your life. 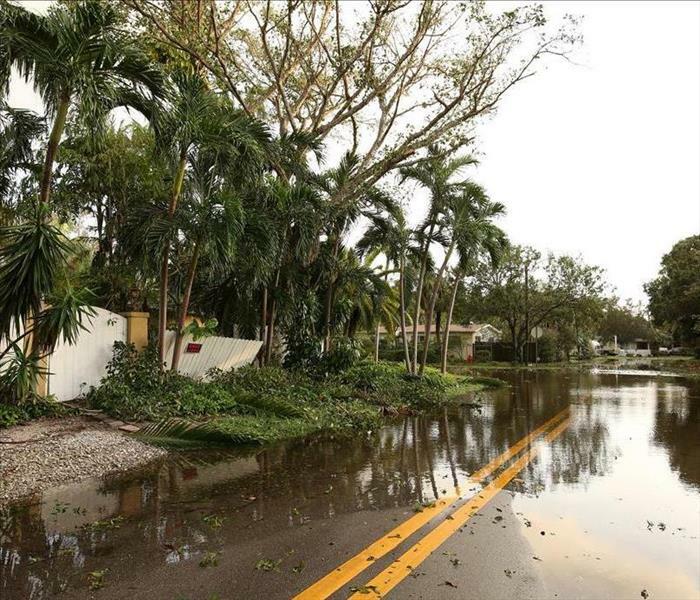 Living in Largo, that means being ready to face strong winds, torrential downpours, and storms, even when they are not part of a hurricane system. As much as we may install impact windows and take precautions, it only takes one weather event to create an entryway into your home and allow water to seep through. For your storm water removal needs in Largo SERVPRO is here to help. Whether the emergency is only at your home or extends to a broader area, our response team is available 24/7 to address your needs. An essential part of becoming a part of our SERVPRO family is formally training on water removal techniques. Our crew is IICRC-certified on the best industry practices which we combine with on-the-field experience to provide comprehensive service to you in your time of need. Depending on the volume of water that made its way into your home, our SERVPRO crew has different options to use in the extraction process. If the water is somewhat contained, we may be able to remove it by using submersible pumps and handheld extractors. For larger volumes, our Green Fleet counts on truck-mounted pumps that provide a more powerful solution. As the operation progresses, we dispose of the storm water keeping in mind any local regulations and municipal sewage requirements we may need to consider. Once industry-grade moisture sensors confirm that all water is extracted, we proceed to dry your home and belongings. Aside from drying the air itself, we approach each surface with a specific plan to salvage as much as we can. Very often, outside water coming into your home is filled with debris and unwanted bacteria which forces us to dispose of items such as upholstered furniture and carpet. Our SERVPRO team takes charge and removes these items from your home as recommended by environmental considerations. Check out the Highland Family Aquatic Center, click here. Condos like yours throughout Largo get constructed with premier construction materials to provide the most aesthetic appeal and alluring appearance for owners. This construction also makes a fast response to water loss incidents essential. Our professionals offer a 24/7 emergency response to water loss threats and other disasters that can affect your condo, arriving with our IICRC-certified technicians and stocked production trucks full of our industry-leading recovery and restoration equipment. Many property owners mistakenly believe that they can manage Largo water extraction and drying efforts on their own with minimal equipment. These situations can quickly spread beyond the areas that you can see, affected subflooring, wall cavities, ceiling spaces, and other inaccessible areas of the condo. Not only does this scenario encourage secondary effects like mold growth, but it can also continually weaken and damage exposed construction materials, eventually requiring their removal and replacement. From the time that our SERVPRO professionals arrive at your condo, we work quickly to establish the full scope of the damage that the property has sustained. This process begins with identifying the source of the water damage and repairing this concern if necessary. Moisture detection and thermal imagery play a role in determining inaccessible areas with water damage and dampness and noting the best locations for drying equipment to get installed to maximize their output. Before we can effectively dry out the damaged condo, we have to address any standing water throughout the damaged rooms of the property. While we arrive with extractor trucks and trash pumps boasting up to 300 psi water removal power, often portable sump pumps and wet-vacs with extraction wands suffice for quickly removing any pooling water from the exposed portions of your condo. With a fast response to these emergencies, our SERVPRO of Largo team can often preserve original construction materials. Too long battling moisture and dampness, and these same materials become too badly damaged to preserve or restore and must get removed and replaced to recover the property. Give our experienced team a call today at (727) 586-0060. Click here for more information about Largo. he damage left behind from a fire can be overwhelming, trust SERVPRO to remediate the damage "Like it never even happened." When there is a fire in your home, it does not take much to be overwhelmed with the damage. The odor alone can make it unbearable just to be in your house, even if you are still able to reside there safely. While odor removal after fire damage might just be one facet of the services our experienced team offers, it is one that is commonly overlooked, misunderstood and undervalued. The process naturally begins with cleaning up the mess. Professional cleaning means wiping down and removing any of the soot and smoke damage to surfaces and structures throughout the affected area. This procedure begins with using tools like handheld auto scrubbers to directly and thoroughly scrub away the debris and soot left behind after the blaze. Now that you can begin to see what your house looks like underneath the film of fire damage in your Indian Rocks Beach home, it is time to remove the lingering odor. Odor removal is accomplished in different ways depending on the severity of the smell. At SERVPRO, we use thermal foggers to remove the harsh smell of smoke after a fire. These machines offer a solution of deodorizing chemicals that eliminate the odor present in your home by completely neutralizing it on contact. Deodorizing is a fast process and one that can keep fabrics and upholstery nearby from fully absorbing the odor and requiring more direct cleaning efforts. While fire damages to your home might seem insurmountable at first, taking steps like removing the smoke and burning smell in the air can help you to appreciate the step-by-step process of fire damage restorations. Our experienced SERVPRO team of professionals has a trained eye and nose for completely bringing your home back to the state it was before the fire ever happened. Acting quickly can help to not only make the odor removal process much more straightforward, but it can also help to lower claims and potential out-of-pocket expenses. If you are dealing with fire damages now, or if you ever have to, trust our team at SERVPRO of Largo. Call us anytime you need us at (727) 586-0060. For more information regarding Indian Rocks Beach, click here. Flooding can cause water to rush downstream and cause significant damage to your home. When this tragedy occurs we are available 24/7 to help you. Heavy rainfall is a common cause of flash flooding, and during the wet seasons, it is essential to keep an eye on state warning stations. As the name suggests, this phenomenom can cause significant amounts of water to rush downstream with very little warning. The effects can be devastating with as little as two feet of moving water capable of uprooting trees. Your property can sustain damages to both the interior and exterior should you be nearby when flash flooding occurs. State regulations must be adhered to when dealing with flood damage in Indian Rocks Beach. Exterior parts of the home like trees, doors, garages, vehicles, or windows can be significantly harmed by a flash flood. These debris are then difficult to remove and may require haulage or a temporary dumpster to avoid breaking local laws. SERVPRO is here to help you sift through the debris, assess which items can be salvaged and dispose of the items that cannot. As a company with extensive experience in flood damages, our rapid response unit can perform some tasks to get you on your way back to recovery. From restoring power your home to making the site safe for general contractors and third-parties to perform remodeling works, we are here to help you every step of the way. Our technicians are experts in removing and drying structures as well as spotting potential hazards and using a combination of gas-powered pumping systems and industrial water extractors we can, in most cases, remove excess water before it causes undue harm to the structure of your home. In some, but not all, flooding situations water may be contaminated. We have the correct safety equipment, including hazmat suits, and can demolish sections of drywall to ensure your home is sanitary. The flooding of a property can be extremely debilitating which is why using a service that has the honesty, know-how, and expertise to get the job done efficiently. Our experience helps us to answer important questions on where to store belongings, assessing safety issues or structural deficiencies as well as providing personable customer service. Our services can help you get your home back to preloss conditions after a natural disaster, contact SERVPRO of Largo at (727) 586-0060. Click here to learn more about how you can park free and ride the trolley for free. ur SERVPRO technicians have a multi-step process to return your home to a pre-mold state "Like it never even happened." Fire and water damage is easy to spot and remove from homes in Belleair Bluffs. Since mold is a quiet disaster, it is much harder to find and just as difficult to clean and remove. Mold damage in Belleair Bluffs starts with tiny mold spores. Normally, these spores are harmless to people and property in their homes. When they come into contact with a source of water, they begin to expand and grow, sending extensions called hyphae to search for a food source. When a colony of mold grows large enough, it can damage property and cause health effects. Fortunately, SERVPRO has a plan. To remove and clean mold from homes, we have developed a series of tasks that stop growth, protect property and clear out spores quickly. Our first step is to reduce exposure to the mold. Our technicians isolate contaminated areas to prevent accidentally exposing uncontaminated parts of the home to active mold spores. We document everything. The restoration team leader starts with our initial inspection and then records the location and size of each instance of mold. We also record the results of the air content testing we make to see how many spores are floating in the air along with moisture levels. We also record air content levels in unaffected rooms to understand what the normal levels are for each home. After testing and isolation, we move to control the contamination at its source. To do this, we set up negative air machines which force spores, dust, and other particulates out of the air. Next, we use commercial vacuums with HEPA filters to remove spores from every surface. That includes not just floors and personal property, but drywall and ceiling tiles as well. Now we remove the mold from the contaminated area. In addition to the vacuums, SERVPRO restoration teams also wipe down every surface with a dry cloth or sponge. If the mold layer is very thick, we use water or a cleaning agent to break it up and remove it with a damp cloth or sponge. If the hyphae have grown into building material like drywall, we remove and replace it. Our last task is to lower moisture levels to normal. It reduces the chance of new mold growth and makes the home more comfortable for residents. We use dehumidifiers to draw water from the air and nearby property. Returning your Florida home to its pre-mold state is not an easy or quick process. SERVPRO of Largo is here to walk you through each step and even help you with your homeowner insurance company. For more information on what our teams can do for you, call today at (727) 586-0060. Click here for more information regarding Belleair Bluffs. Signs of water damage or a musty smell are reasons to give SERVPRO a call to come out and assess the situation. Call today. It is no secret that old homes are plagued by problems. The main issue, whether the house is ancient or modern, is the threat of water damage. It does not take long for it to wreak havoc on a home. One broken pipe could be enough to result in damage which requires several hours of labor and thousands of dollars for repair. Sometimes the water damage your Belleair Bluff home sustains is very evident and can be spotted easily by the untrained eye. However, it can be a subtle problem as well, creeping up on you and making significant destruction before you realize it is there. 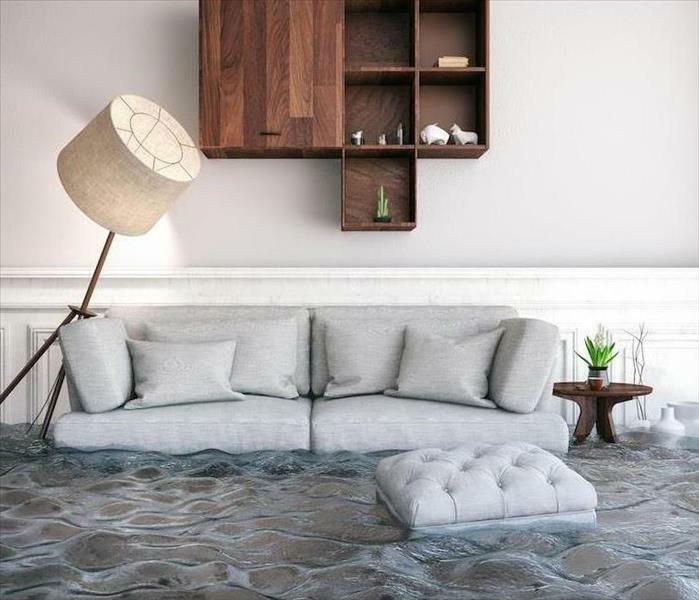 No matter the type of water damage, you want to have a professional water damage remediation company come in to help you dry your home out and make the repairs needed. SERVPRO is always ready to assist you with this. Some signs that you could have water damage are good to keep an eye out for, especially in your older home. Water stains are telltale signs on your wall or ceiling and are usually evident. If you see one suddenly appear, it is a good time to call up SERVPRO and get a technician to check your home to see where the water is coming from. Buckling walls and floors are another very clear sign, and is often the mark of a severe problem. Wood or drywall absorbs water, making it swell. The result is buckling which you can feel or see when you are walking over the area. It can occur over time like with a small leak in your shower or can happen suddenly like when an appliance floods your home. Areas which are crumbling, such as the wood around your windows, molding, or baseboards, is also a sign of water damage. Any crumbling may indicate the wood is disintegrating from water infiltration. Trust your nose as well. The damage might be hidden from your sight, but many times you can detect it with your nose. If you smell a mildew or musty scent, there may be moisture damage behind your walls. SERVPRO can use special moisture meters to detect such moisture and fix the problem for you. A lot of old houses have a musty, old smell, but in rooms, with water damage, the smell is much stronger. If you cannot see a leak anywhere, you can sometimes sense it, so listen closely. If you believe there is a hidden leak coming from your roof, you should try using your ears to listen. During a rainstorm, turn everything in the house off including the central air or heat. The goal here is to make the house as quiet as possible; then you can stand in different places where you suspect there is a leak and listen. Water dripping through your roof is a very different sound then water landing on your roof. SERVPRO of Largo can find the source of the leak in your older home and fix it, dry your home and possessions out and repair any damage. All you have to do is give them a call at (727) 586-0060, and they send a technician out to you in a timely fashion, so your home is dry and safe in no time. SERVPRO Provides Industry-Leading Water Removal Equipment for Largo Businesses--Really!! Water damage in your restaurant doesn’t happen only from major storms, flooding, or natural disasters. Sometimes, human error and malfunctioning systems in the structure can cause a great deal of damage. Whatever the cause, the results can be financially and structurally devastating, and you’ll need professional help from a remediation company to help restore your building. Water removal services for your Largo business are not something you want to ignore. Once you have a problem, you should get in touch with our staff at SERVPRO right away. We can help you any time of the day or week, and we have the training and experience to get your restaurant back up and running as usual in no time. Broken pipes are one problem that can occur. The sinks and bathrooms in your building are in frequent use, and sometimes pipes can break due to corrosion, improper installation, or a sudden increase in water pressure. SERVPRO techs can clean up the water that is now sitting all over the floor and dry the affected area. 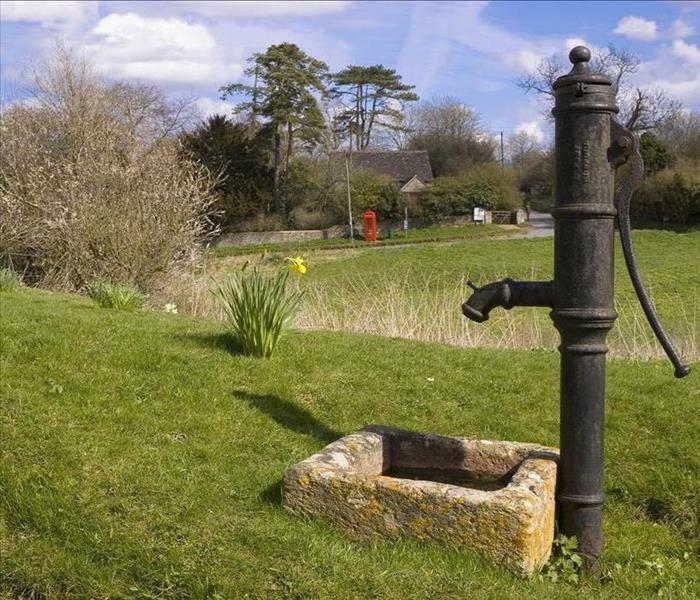 Truck-mounted pumps are used if the water is deep enough so that the standing water is removed as quickly as possible. Once that is done, we can get rid of the rest of the moisture with industrial fans and dehumidifiers that are monitored daily. Your sewage system can become clogged, and water backflows when a toilet is flushed, or water is poured down a drain. It usually happens when items which are non-biodegradable are flushed down the toilet or when oil is poured into sinks, which creates hazardous contaminants in the floodwater that results. Your building’s roof should also be checked regularly and maintained properly so that it can function as it should. When it is left unchecked instead, you could be missing leaks that have formed from inclement weather or shingles that have fallen off. A slow leak can do a fair amount of damage, especially since they generally go unseen for a long time. When heavy appliances such as refrigerators, walk-in freezers, dishwashers or washing machines malfunction, you can easily wind up with indoor flooding that can wreak havoc on your building and other items in your restaurant. 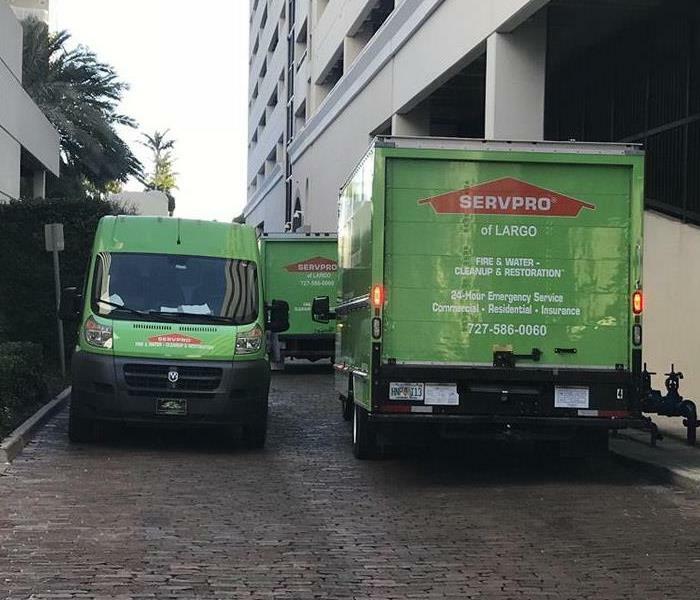 SERVPRO of Largo understands that when your business in Indian Rocks Beach, Harbor Bluffs or Dunedin experiences a water damage emergency, time is of the essence. Call one of our staff members at (727) 586-0060, so we can help you clean up the mess and get you serving customers again like usual. Let our SERVPRO of Largo rapid response team provide this inspection and necessary mitigation for your property in this troubling time. If a fire breaks out in your Belleair home, many owners become most concerned with getting their families to safety or grabbing a few irreplaceable items to protect. 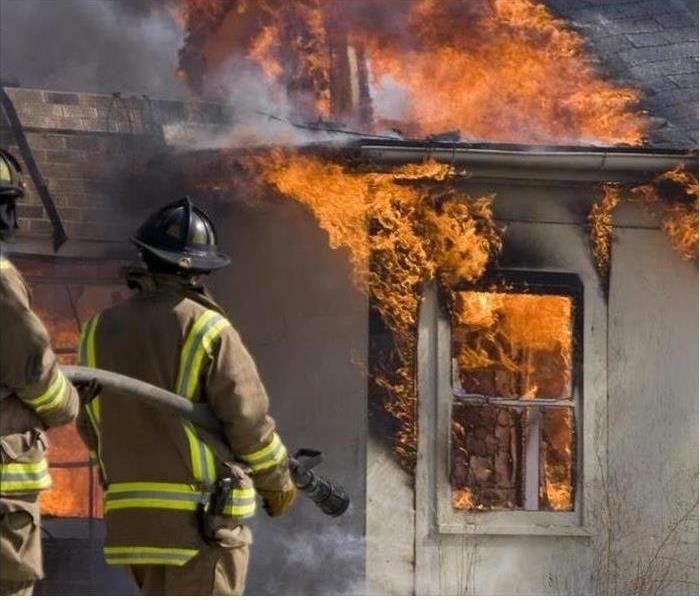 Structure fires can spread quickly, threatening not only the property but also those that choose to go back inside once the fire has gotten extinguished. It is never advisable to assess damage on your own, as many hazardous variables could injure or adversely affect the inspecting party. As your insurance company requires a detailed catalog of the fire damage to your Belleair home after the incident to process a claim, many homeowners might believe that they have no choice but to face these potential hazards to get the approval for their claim. Our SERVPRO professionals can arrive quickly after you call to provide this thorough inspection on your behalf, cataloging all of the damage and providing photographic evidence of the effects for your insurance adjuster to expedite your claim’s approval. The estimator we dispatch to provide this inspection also works to determine the proposed cost to repair and restore the damage to the property. This information includes the personnel required, processes needed, and what areas might require complete reconstruction to get restored entirely. Additionally, our SERVPRO professionals work to mitigate your loss with this initial visit to your home following the disaster. This process begins with debris removal and indoor air quality control. We can address hazards and risks such as structural failures through this debris removal process, ensuring that glaring concerns get taken care of before the restoration work begins on your property. Our Contents Department can also remove at-risk items through this mitigation process to take to our facility for cleaning and deodorization. 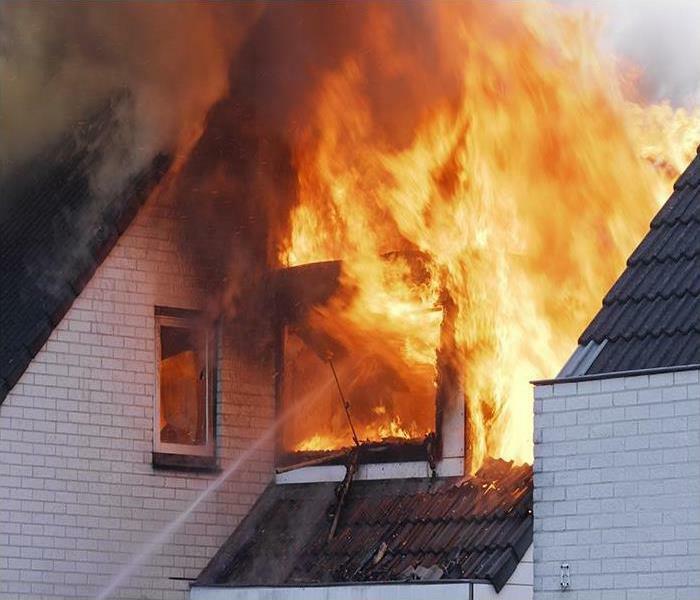 After a fire has affected your home, you do not have much time before your insurance provider needs credible information to substantiate your damage claim. Let our SERVPRO of Largo rapid response team provide this inspection and necessary mitigation for your property in this troubling time. Give us a call at (727) 586-0060. Click here for more about Belleair. Leave mold remediation to the pros at SERVPRO of Largo! 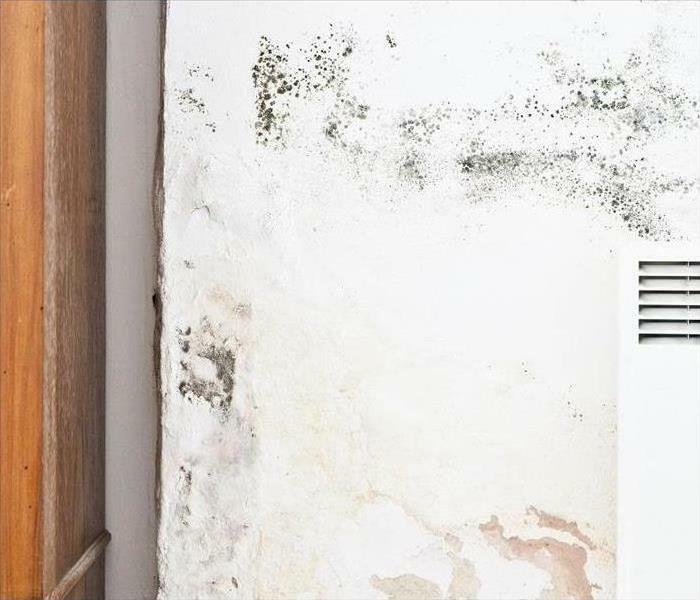 The worst kind of mold damage in condo units to find happens when a homeowner believes they have a single issue to repair, and it turns into a mold remediation project. Mold is a problem that continues to get worse as long as it has food, moisture and an ideal temperature range to flourish. SERVPRO responded to a home for a light water removal job. The technicians searching for the cause of the water determined it was a clogged condensation pan in the HVAC system in the attic. There was a concern because the areas around the HVAC held moisture and upon vacuuming the insulation to get to the wood, mold growth was hidden underneath. Immediate mold remediation efforts in the Largo condo began. One of the best ways to stop mold is to take away the things it needs to survive, the first to go is moisture. The area was contained to stop the spread of spores in the home. Air movers and a dehumidifier quickly lowered the moisture and dried the surfaces within the contained space. Instead of using wet cleaning methods, SERVPRO technicians chose to use soda blasting which is a waterless, lightly abrasive method that cleans away mold and deodorizes at the same time. After the attic was thoroughly dried, vacuums with HEPA filters to capture mold spores were used to remove remaining dried debris. Then, techs wiped down the wood and affected surfaces with a powerful antifungal solution to inhibit the return of mold. Mold leaves a very distinctive odor, and in the attic, it would have the potential to get passed through the home through the HVAC system. The use of both a ULV fogger and ventilation fan neutralized the unpleasant musty odor in the attic. Mold damage in condo units should be removed as soon as you notice dampness or an odor. SERVPRO of Largo has certified technicians that are available 24/7 to help return your home to its preloss condition. Call (727) 586-0060 and talk to one of our experts now. For more information regarding the city of Largo, click here. 2/18/2019 - Got Mold? We Have A SERVPRO Solution!